Gosh, I haven’t lined my eyes for so long, that I seem to have forgotten how! LOL! No, I’m serious! I tightline my eyes daily, but I haven’t lined the top lid in ages for one very simple reason….. my old liquid liner dried out! LOL Yes, I’m dead serious. 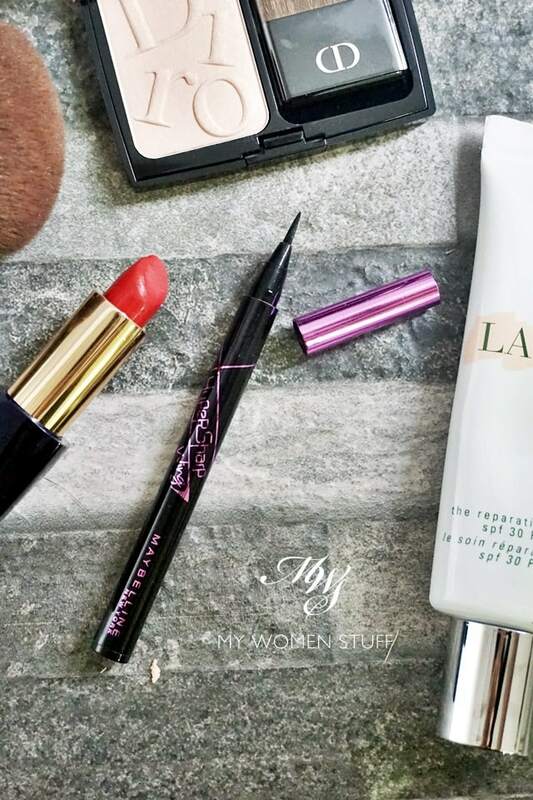 When I line the top lid, I prefer using a liquid liner, because it doesn’t mess up as quickly and the one I’d been using was the very affordable and easy to use, Maybelline Hypersharp liner. When I first laid eyes on the new Maybelline Hypersharp Wing liner, I thought “Oh hey! I can line my lids again!” and this time, this new liner promises you a much easier way to get a winged eyeliner look. Winged liner “On fleek” as the young ‘uns will say LOL! Looks pretty unassuming, doesn’t it? Like its earlier Hypersharp sibling, the new Hypersharp Wing liner is a liquid liner in a felt tip pen form. But if you look further down, here’s what makes this particular one a doddle to use, if you want to create a winged tip, or just a thick liner. What makes the Hypersharp Wing liner a little more unique than most, is the nib of the pen. It has a rather firm nib that has a little bit of flex to it, but it is your ability to use it in 2 ways, that makes it special. Here’s how the nib looks. From the side, it looks flat. If you use this flat edge, you will get a nice thin line. From the top (top being relative), you see a flat tapered paddle shaped nib. This allows you to draw a fairly broad line, while the tapered tip allows for a bit of a flick, if you are into that. Here, let me show you how it looks when I draw on the back of my hand. But this “dual tip” liner pen does make it easier, make no mistake. Does it give me a good winged liner? Well, it’s hard to say you know. I don’t really go for that look. So here’s how I would use it, pretty much the same way I use all my liquid liners to line my upper eyelid. What I do like about this, is how easy it is to get a thick line. If you have slightly hooded or hidden lids like mine, you might realise that you need to draw a significantly thicker liner to get it to show when your eyes are open. While you can use any regular liner to do the job, the flat, broader side of the Hypersharp Wing liner makes it easier to achieve this with the minimum of fuss. The upshot of this, is that you get the job done more quickly and that’s always a good thing. It’s also fairly affordable, which is always a good thing when it comes to products like these that dry out easily. Yes, that’s one of the drawbacks you will find. Like its cousin the Hypersharp liner, there will be a tendency for this to dry out quickly. The other thing that has me feeling a little more ambivalent is the depth of colour. This isn’t as black as I’d like it to be. If you look at the swatches on the back of my hand, you may notice that while it’s black, it isn’t a deep, intense black. It’s more of a watered down black, and I do find that if you “stretch” the product in the wing, the colour can fade a little. Ditto if you use it over a cream eyeshadow. It glides on easily, but it isn’t very black. The third strike against this is how the felt tip “skips” a little. If you look at the line I drew on the close up of my eye, you may notice how the end isn’t as sharp as it should be. 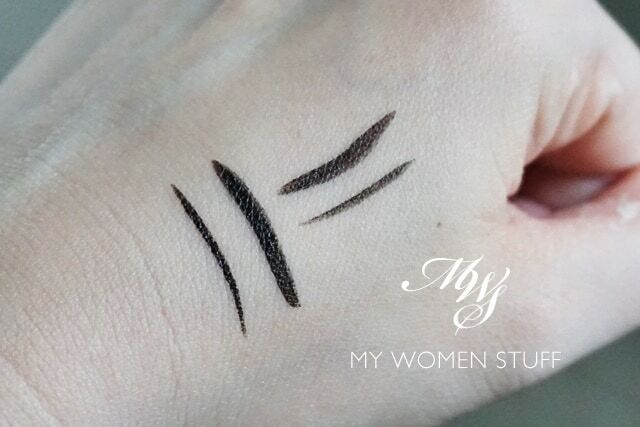 Yes, I can tidy it up and present to you a perfect looking winged eyeliner, but then I’d not be able to show you that it sometimes doesn’t look that way immediately, especially if you just go over with one pass. Otherwise, if you get past all that, it’s affordable, its easy to use, I find that it dries quickly so it doesn’t interfere with my eye makeup, and it lasts all day (it’s humid where I live). I’d say it’s a decent product. Could be better, but decent nonetheless. The Maybelline Hypersharp Wing Liner is a liquid liner in a felt tip pen form. The tip is flat with a tapered paddle shape that you can use to create a fairly thick line, or you can twist it on its side and use the thin edge to draw a thin line, or create a winged tip flick. It glides on easily, it dries quickly and it stays put, on top of being affordable. However, I would prefer if it had a more intense black colour, and the tip can skip a little. 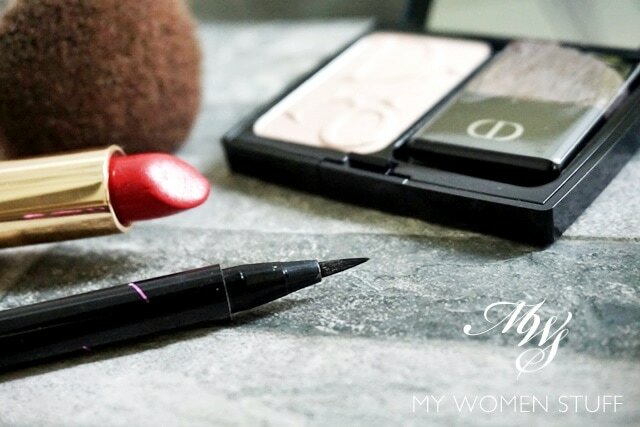 But if you like creating thick eyeliner, then this is an affordable and easy way to do it. Have you tried this new Hypersharp Wing eyeliner? Did you find it useful? I actually found it useful because it takes the work out of drawing a thicker line, and that means less room for error. You can quite literally get a fairly thick line in just 1 swipe of the pen. But if you’re wondering if this can give you the winged eyeliner look that is so craved by many, I’d tell you it comes with practice. This makes it easier, but its about the workman, not merely the tools 😉 Let me know if you’ve tried this – I’d love to hear what you think about it. NEXT POST: The case for wearing a base – Wearing foundation and BB Cream can be good for your skin! I tried to find this at the drugstores but they were always sold on! Either the product is really good or customers liked what they heard in the advert LOL I saw in the advert that why it’s easy to make cat’s eye because just a little turn, you can start from the thin line then flick! Made that cat’s eye end with the broad line. Honestly, I don’t like those pen-tip eyeliner; they usually smell weird, I don’t like the pen-tip feel and when apply at my eyelids, the colour seems to fade or not as intense as it look at the back of my hand. This looks like a fantastic product! I can’t do winged liner for my life, so I’ll definitely check this out! I didn’t really like this the first couple of times I used it but it is growing on me. I do wish it was blacker though and I notice it fades a little throughout the day. I like the concept though! I love this. Affordable, easily available, easy to use once get the hang of it and most of all, the color. I love my black liners to be true black. This falls into this category of black i prefer. Easy to wash off too and last the humid weather. No cons for me really. Do you know any gel/pencil eyeliner is good (doesn’t smudge) for eye waterline?